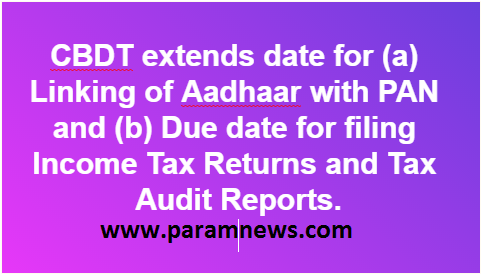 CBDT extends date for (a) Linking of Aadhaar with PAN and (b) Due date for filing Income Tax Returns and Tax Audit Reports. ii. The ‘due-date’ for filing Income Tax Returns and various reports of audit prescribed under the Income-tax Act,1961 has been extended from 30th September, 2017 to 31st October, 2017 for all taxpayers who were liable to file their Income Tax Returns by 30th September, 2017.